This true story took place in 1956 Arizona. It deals with a rancher and cowboy dilemma then and now. There is no solution to this problem, but this antlered friend of mine had his own ideas about escaping life’s intrusions. You may need lots of grey in your whiskers to understand this authentic tale. It originated long ago when Arizona was still young and wild. Only a State then for a short spell. Many cowpunchers still wore six-shooters and carried a Winchester rifle in a saddle scabbard. Game was plentiful and many even died from old age instead of an old hunter. Most wild creatures had never encountered a human yet. Especially those critters living in the depths of Sycamore Canyon west of Sedona, Arizona. 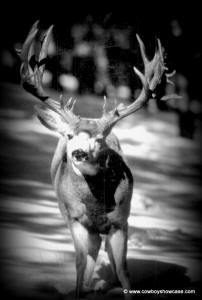 Magnificently antlered buck deer grew up healthy and large while climbing those rough jagged slopes to graze. Their only enemy, the stealthy cougar, made them alert and quick to escape at the slightest sound of a surprise encounter. Their multi-pointed racks were impossible to count when they were bounding off on the run. Still cowboys tried to count them because they believed each point on one side revealed their years on this earth. They usually were gone from view by the time we counted seven or so. "Old Hatrack" we named one buck carrying so many points, jumbled around on his noble head, that we never made a proper tally. Still . . . we always tried to be the one to get that number correct! They were interwoven and tangled which sometimes caused death for two bucks that struggled to their death while in playful or serious battle from which they could never untwine. Deep in that canyon one day, but still not on the actual floor of the chasm, I was making a casual ride checking on our supply of salt-lick and our cattle’s general welfare. My briskly striding horse was picking his own way down a long narrowing ridge to the area of Barney Mesa. Barney Springs were still far below us as I entered into the holding area we built, using the topography of this mesa to create a pasture. mesas before reaching the bottom. This mesa’s top was shaped like a horseshoe. Encircled by nearly one hundred foot high cliffs, that required no fencing to hold livestock. We only fenced a mere fifty yards, cliff to cliff, between the heels of the horseshoe and added a gate. The result-a 100 acres of holding pen full of grass. Barney Mesa’s topography made it easy for us to build this pasture because we, thankfully, packed in a lot less fencing materials on our horses, from the rim top seven miles above. The only other exit was at the center toe of the horseshoe-a quarter-mile narrow trail straight down to Barney Spring, one of the few trails that made some ‘punchers lead their horse both up and down. I usually rode a circle and planned ahead to only travel downhill on this trail. I sure didn’t cherish making that winding, steep, uphill struggle too often. Cattle and game that are left to their own life never hurry. They traveled up and down perilous trails, to and from water, smoothly and carefully, taking all the time they needed to navigate tricky places to satisfy their thirst. Your horse, being of an impatient nature, must be taught to travel like they do. . . . “When roaming do as the roamers do!” At the far edge center it was easy to close off this precarious downhill trail to the spring. The boulder strewn steep edge squeezed in to just a doorway like trailhead. A doorway where we could block the trail by using five or six large thick dead cedar tree limbs, thereby stopping passage to and from the mesa. Below at Barney Spring we all admired and enjoyed the two hewn-out, long, connected Ponderosa logs that captured fresh water for cattle and game. That constant overflow of spring water created a seasonal downhill garden of precious grass and other beneficial growth. That afternoon the mesa seemed empty as I headed for that rock strewn path down to Barney Springs. About half way in, I spotted Old Hatrack off to my left. I had surprised him and he bounded off further to the left. This put me blocking his return path both down to the spring and back out to the fenced entrance. Of course he could jump the fence anywhere he got to it but I rode back and forth, without crowding him, to keep him from coming in my direction. He was most comfortable when forty yards away from me and my horse. To him we were just another, but unusual, four legged beast. Some places the manzanita, juniper, cedar and oak brush was very thick. I used these natural obstacles to help herd the big old Buck way from us and the gated fence behind me. Also slowly, zigzagging back and forth so he could not break for the rocky downhill exit to the spring trail. The thick brush still kept me from getting a good count on his numerous points. I was staying too far away for a good look at him. This was my best shot at getting a perfect count. Still, if I crowded him too much, he could dash madly anywhere, even right over us to pass. It was as if making cautious moves on a chessboard and you know how long chess games go on. We handled our wild cattle in this same manner, slowly getting them accustomed to our presence while pointing them in the right direction. It was a beautiful afternoon for this pleasant, friendly game. Nothing was too desperate . . . Yet! The cliff’s edge was getting closer and we both were becoming aware of that. Old Hatrack began to show his anxiety by making more hurried escape dashes to the left and right This caused me to lose count, over and over, of his more than eighteen points. Even at that, I surmised he was over nine years old. I paused now at this moment in the game, sensing the distress I had caused him by intruding on his usually serene existence. Yes, animal faces do have expressions. handled leaping and weaving away thru the thick brush to parts unknown. I watched him until he became lost in the wooded distance. Gratefully thanking our God for for Hatrack’s salvation. Now when this dangerous, damaged, congested, confusing world swirls around me relentlessly, I recall that encounter with courageous Old Hatrack who taught me, importantly, there will always be an escape route if you dare to take it. . . .
Will I? . . . Will you? "LIFE IS MADE FOR LIVING"